On May 18, 1925 Ernestine Geisbiegler, the real name of Erni Bieler, was born. Born into a musical family - her older brother was a member of the Vienna Symphony Orchestra - she also takes the musical path. In 1945 she finished her training as a dramatic coloratura soprano and was soon faced with the choice of joining the Vienna State Opera Choir or performing on small provincial stages. Her choice is light music, and so she and her fellow students Toni and Ina Winkler form the Vienna Terzett, which initially performs at private parties and smaller public events. A first success is her engagement in the Viennese'Tabarin-Club', where the third is reinforced by a talented pianist. At the same time, Erni distinguishes herself as a jazz singer in the American Red Cross Club. And not without leaving an impression. In the American jazz magazine'Downbeat' there is a laudatory article about her from this time. Her brother doesn't want to taste this development because he fears that Erni will ruin her voice with this kind of music. But the dam is broken, it can no longer be stopped. The next stop in Ernis career is an engagement as a singer in Hans Koller's'Hot Club Vienna'. Once again, a voice that was closely linked to the history of the German-language hit has fallen silent forever: Erni Bieler died in Vienna on July 11. Her great love was jazz - but she was never averse to light entertainment music either. Thus it became the undisputed number 1 in the Austrian hit of the early 50s. 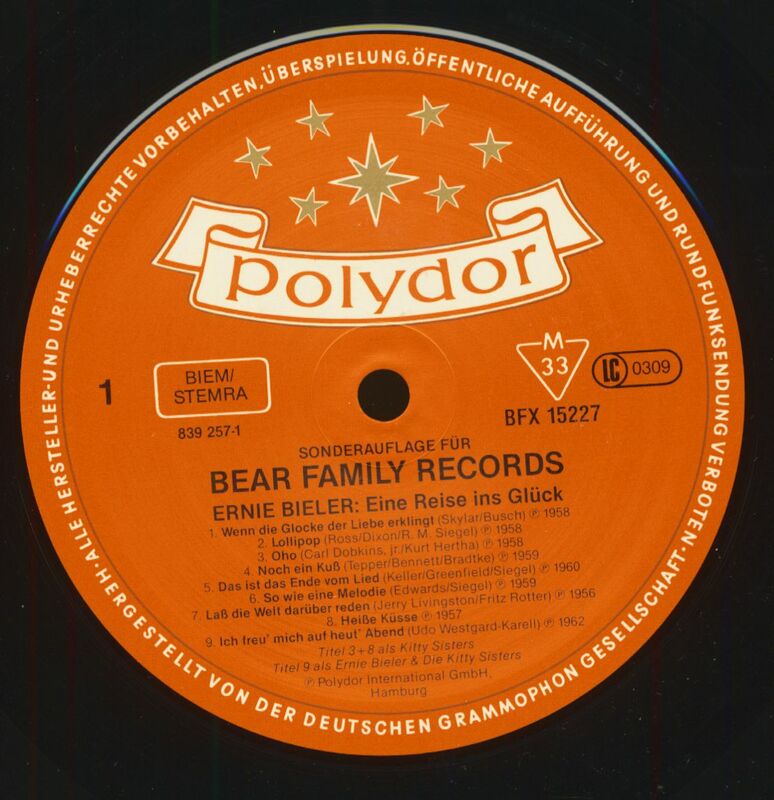 Ernestine Geisbiegler, Erni Bieler's real name, was born on 18 May 1925. She finished her training as a coloratura soprano in 1945, but then decided on the light muse. Together with her fellow students Toni and Ina Winkler she founded the Vienna Terzett and also appeared in Hans Koller's'Hot Club Vienna'. 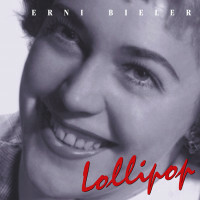 The music producer Gerhard Mendelson offered her a record deal, and he chose her as'Erni Bieler' for the German-language pop song. 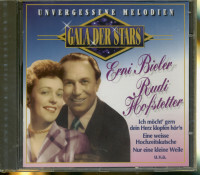 She made her debut recordings from 1947 for the companies Astra-Schall and Harmona, then followed the first titles on Elite Special, among others in duet with Rudi Hofstetter and Peter Alexander. 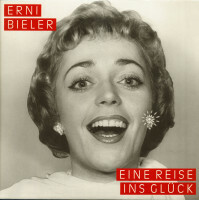 Erni Bieler began her career with Polydor in 1954 - as a solo and ensemble singer. But it took until 1956 before she landed her first big success with Lass die Welt reden together with the music boys. In the same year, records appeared on the Heliodor label under the pseudonym Kitty Sisters. The multi-track technology made it possible: Erni Bieler accompanied himself. Their records were released by Polydor until 1962. 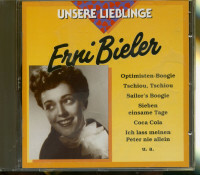 After the end of her pop career, Ernie Bieler briefly returned to her'origins' in the mid-sixties, recording Viennese and operetta songs for Amadeo and Ariola. After that followed several radio productions before she finally withdrew into private life with the musician Jula Koch. In the 70s and early 80s, the singer was a popular guest on television evergreen shows. She made her last appearance in 1996, when she once again presented her successful titles with Rudi Hofstetter in the'Musikantenstadl'. 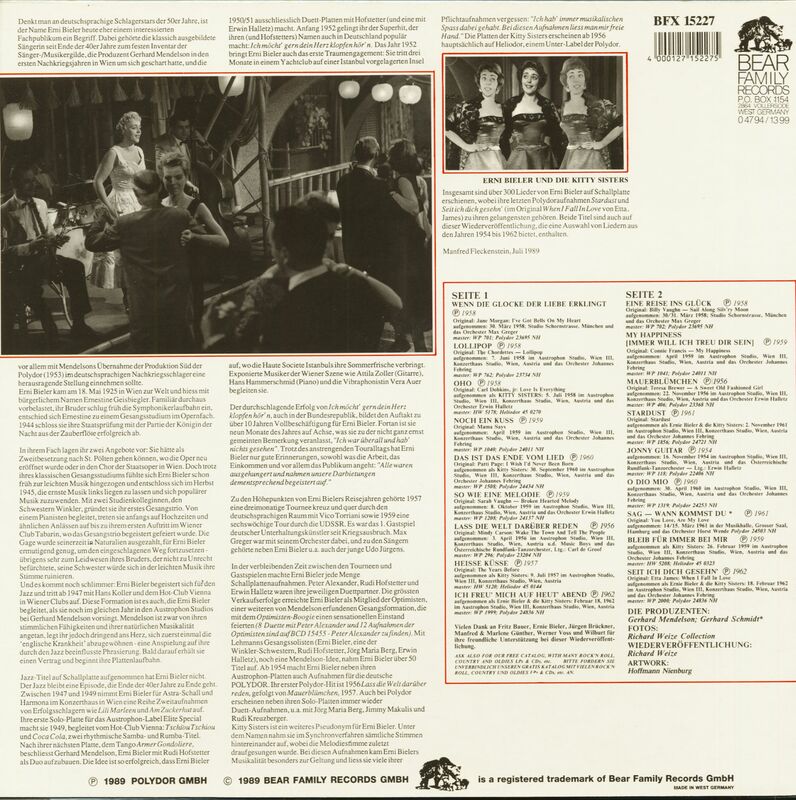 Customer evaluation for "Eine Reise ins Glück (LP)"